WILLEMSTAD - On Sunday, Royal Caribbean International's Adventure of the Seas made a humanitarian stop in St. Maarten to drop off supplies and evacuate more than 300 people following Hurricane Irma. Before reaching Puerto Rico, the final destination of the cruise, the ship docked in Curacao today, before heading to Aruba. Staff of the U.S. Consulate General Curacao provided assistance to the U.S. citizen evacuees, which included a visit to a medical doctor for evacuees requiring medical attention, and a visit by a local veterinarian to provide care for pets. 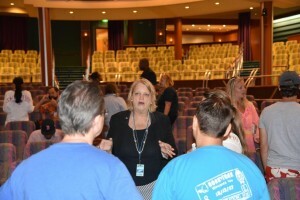 U.S. Consul General Margaret Hawthorne expressed her gratitude to Royal Caribbean International for their support and reassured evacuees that the U.S. government is making every effort to evacuate U.S. citizens who are still stranded on St. Maarten. The U.S. government expresses its appreciation to the government of Curacao for its assistance in allowing the cruise ship to port in Curacao and for the opportunity for U.S. Consulate General staff to provide assistance to the evacuees.